Jeff Caldwell had no idea they would encounter the evil power of the witch doctor at every turn. 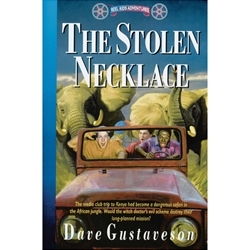 How could the jewel from the mysterious necklace pull them into the witch doctor's evil web? Could they survive all the deadly forces of Africa's wild jungle and disease to complete their mission? After months of dreaming about Africa's splendor and beauty, Jeff and the "Reel Kids" find danger and mystery at every turn. Will the showdown with the witch doctor spell doom to all their plans? Had God really brought them this far to let them be defeated?